Does anyone besides me like reading menus? Really reading them…top to bottom? It’s one of my favorite parts of going out to eat; I can’t get enough of the mouth-watering details and descriptions. I’m always scouting out new restaurants to try, mostly because they offer up new dishes and new reading material. With real literature, getting your hands on the latest and greatest to hit the marketplace is thrilling, but you can’t go wrong with the tried-and-true classics either. The same can be said for restaurants and the quintessential vegetarian venue in Seattle for the last 21 years has been Cafe Flora. Clara Frij pears poached in spiced red wine with St. Andre triple cream Brie, red onion confit and pistachio pesto on Columbia City Bakery Focaccia with a red wine reduction drizzle and chopped pistachios. I pondered the crunch of the bread, the sweet cinnamon spice of the pear, and the buttery melted brie for the 90 minute ride home to Bellingham. Inspiration had struck and I began piecing together how I could recreate it myself. 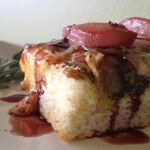 During the taste-testing, Jeff said the finished product reminded him of savory and sweet French toast. I think it would be perfect for brunch, but we happily scarfed it down for dinner. A warning: this is a time-intensive project, but oh, so worth it. 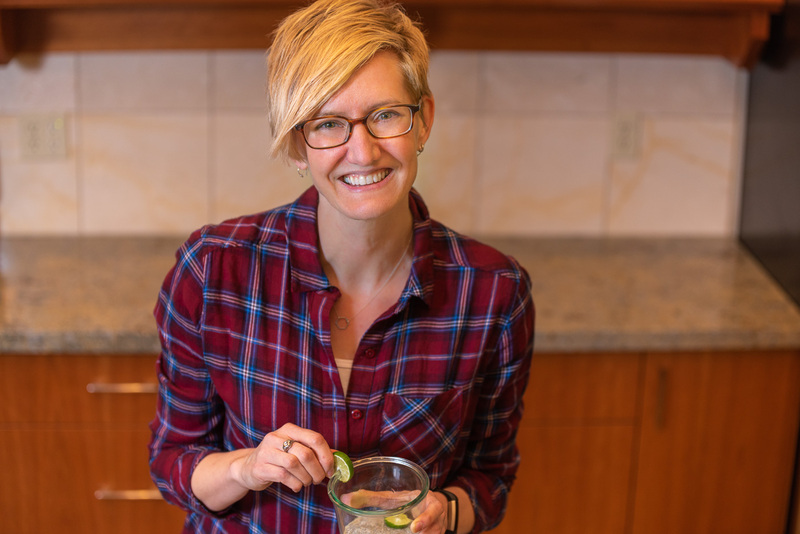 Normally, I’d shy away from a dish that requires three separate recipes to come together just to make one item, but the combination of flavors is spot on. I experimented with a couple of short cuts to save time and they just didn’t provide the same results. So, put on some tunes and get ready to spend a few hours building some pear and brie deliciousness. 1. Preheat the oven to 350 degrees. Cover a large baking sheet with parchment paper. 2. Cut the top crust (about 1/8 inch) off the focaccia. This makes a better surface for the toppings, and in some cases, will remove the salt that’s been sprinkled on the top. Then, cut the focaccia, vertically, in half and place both pieces on the baking sheet. 3. Divide the pesto in half and spread over both pieces of bread. Then, do the same with the onion confit. 4. Place 8 pieces of pear on each half of the bread, face down. Sprinkle the pieces of brie over the top. 5. Bake for 10 minutes to warm through. Then, broil for 5 to 6 minutes or until cheese is golden brown. 6. Cut each focaccia half into 4 pieces. Serve each piece drizzled with 1 tablespoon warm mulled wine syrup. 1. Put all ingredients except the olive oil in a food processor. Pulse until coarsely chopped. 2. 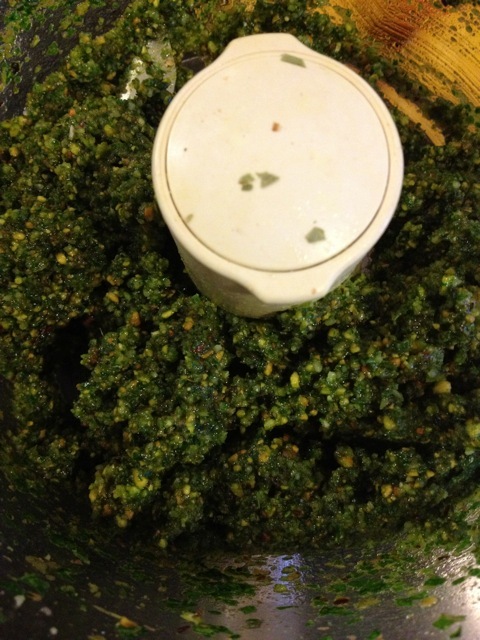 With the food processor running, drizzle in the olive oil until incorporated and pesto is thick and spreadable. 1. Heat the oil in a large skillet over medium heat. Add the onions, coat with oil and reduce heat to medium-low. Season with pepper and salt and break up any big pieces with a wooden spoon. 2. Cook the onions slowly, until soft, about 30 minutes. Your goal is keep them over the heat for a long time without letting them get brown. 3. Stir in the vinegars, broth and sugar. Cook for another 10 minutes or until the liquid has been absorbed. 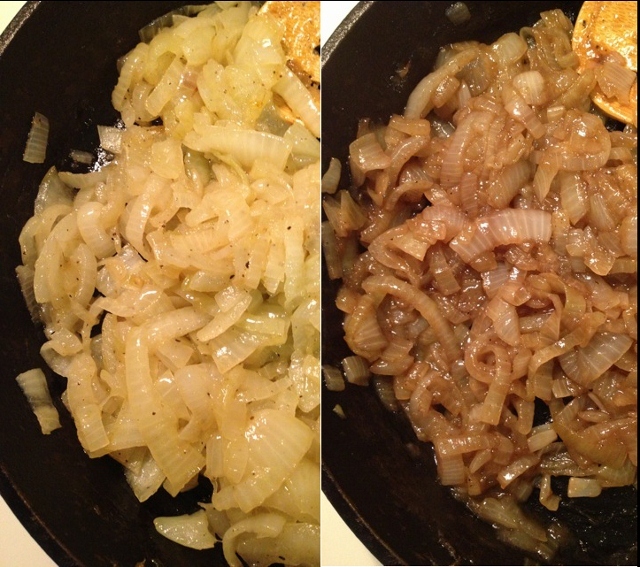 These images show what the onions look like at the start and after 30 minutes of slow cooking. 1. Combine all ingredients except pears in a large, heavy saucepan over medium heat. Stir until sugar dissolves and mixture begins to simmer. 2. Add pears and return to a simmer. Cook gently for 5 to 6 minutes or until pears are tender. 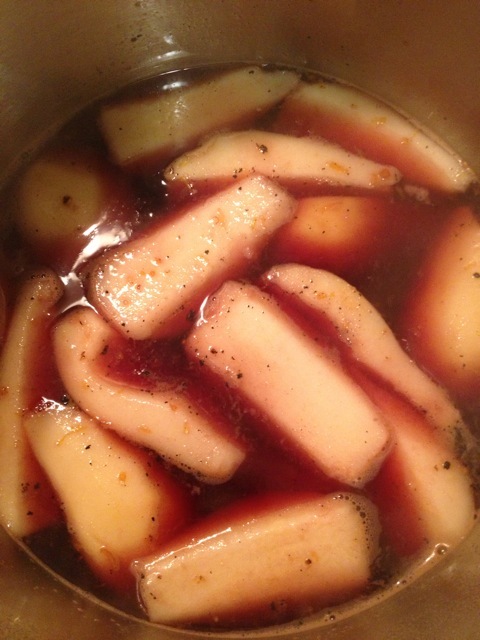 Remove pan from the heat and let the pears sit in the poaching liquid for 5 minutes. Remove cinnamon stick and pears and set aside. 3. Bring the poaching liquid to a boil and cook for 20 to 25 minutes or until it has been reduced to about 3/4 cup. The syrup will thicken as it cools. 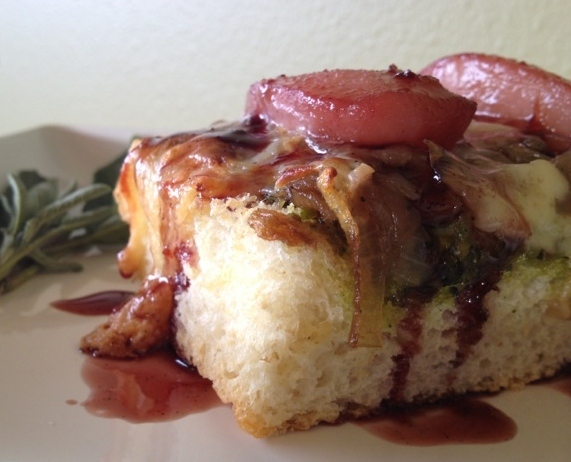 Have you had success recreating a favorite restaurant recipe at home? Are you taking orders? Boy does this sound incredible. I could be persuaded. Maybe we should get together for brunch. It would be a good excuse to make it. This is why we are friends…I read menus for fun (even restaurants that we are just walking by on the street!) and I just came home the other day and made my best attempt at re-creating a coconut curry lentil soup! This recipe sounds yummy – we’ll have to try it! This IS why we are friends. Good to know something as simple as food can sustain a 20-year friendship! I can’t wait to get home to try this. Holy Cow it looks/sounds delicious, and I think Chris would even eat it!!!! Hi Miss Courtenay. I’d love to know if you give it a try. Please feel free to send suggestions for improvement my way. Safe travels. This sounds and looks delish!! Can’t wait to make it. Thanks for posting 🙂 I really enjoy reading your blogs. Miss u! Hey Miss Amy! Miss you, too, but so glad you’re happy with your new man and your new location. Thanks so much for the feedback.